PROSPECT HEIGHTS, Brooklyn (WABC) -- Police have made an arrest in the case of a nun who was threatened inside a Catholic church in Brooklyn. The NYPD says 56-year-old Derrick Gadson of Brooklyn is facing hate crime and drug charges. 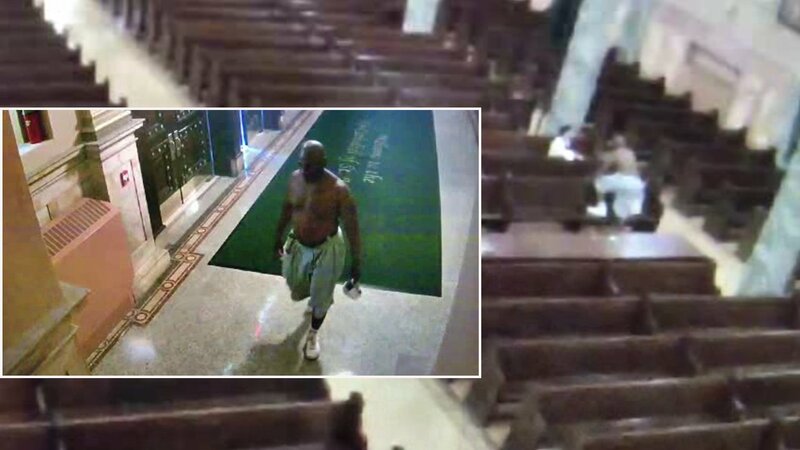 Surveillance video showed a shirtless man walking into the Co-Cathedral of St. Joseph in Prospect Heights Wednesday afternoon. He approached Sister Maria Amador as she was praying in a pew and threatened to kill her. Sister Amador said the man told her, "I don't believe in this because you don't help the poor". When she looked over to a woman sitting nearby, the man said, "She can't help you. I'm going to kill you." The nun ran out of the way, calling for help. "Now I'm safe, I'm fine, but when I watch the video again and I realize that was real, the story could be another way, it could be a hate crime," said Sister Amador. The man left when the church organist stepped in to help.